Here’s great business advice: raising your prices won’t affect how many consumers you have. 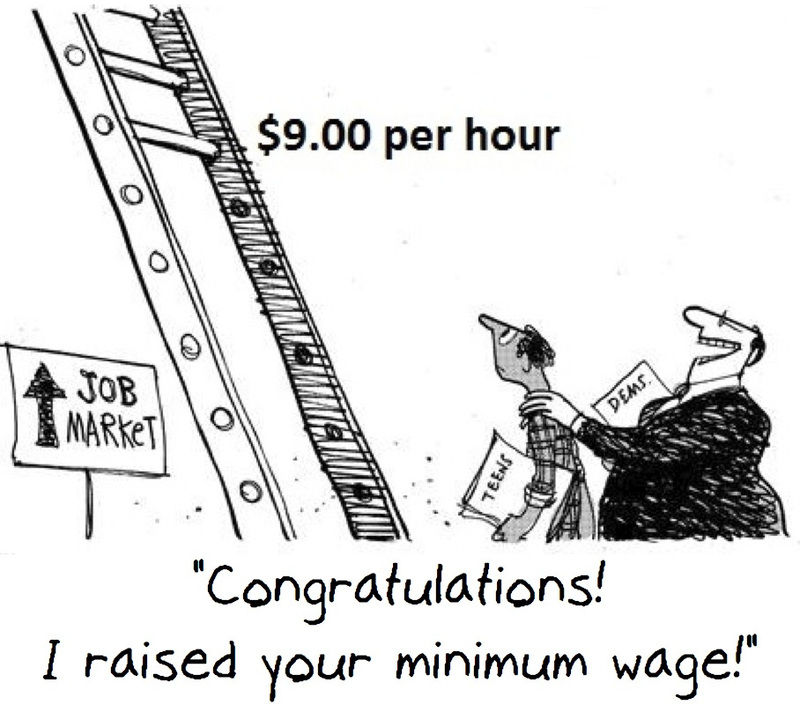 That’s the argument proposed by those who favor raising the minimum wage. Employment won’t be affected by forcibly raising the cost of labor. The evidence for this is that the state continued to see overall job growth. The problem is that this could be explained by a variety of factors, especially its pro-growth tax policies. Washington State has no income tax and has the 6th best state business tax environment, according to the free-market Tax Foundation. The authors should have attempted to isolate the effect of the minimum wage on the one portion of the population that we know are almost entirely low-skilled: teenagers. In 1997, Washington’s 16 to 19 unemployment rate was slightly below the national value (15.8 percent versus 16.0 percent), while in 1998 it was somewhat above the national value (16.0 percent versus 14.6 percent). In 1999, after I-688 came into effect the gap between the Washington and national 16 to 19 unemployment rates expanded to 4.2 percentage points (18.1 percent versus 13.9 percent). 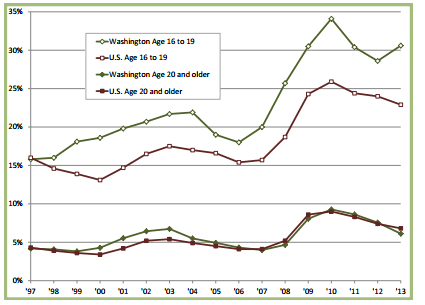 In every year after I-866, Washington’s 16 to 19 unemployment rate is greater than the national value. As Skeptical Libertarian editor Dan Bier has pointed out before, these results conform to national trends. The never-ending desire to believe that government can mandate prosperity will lead to the perpetual production of worthless analyses purporting to show that there is a shortcut to prosperity. There are no shortcuts. We must create policies that increase people’s skills to increase their earnings. The best way to increase someone’s skills? Get them in a job.